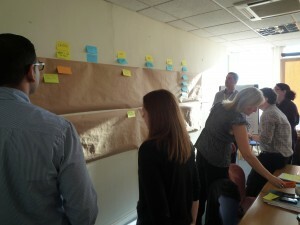 Facilitating a customer journey mapping session for the first time can be daunting. However, assuming you’ve invited the right people from across the business, and those who said they’d come do turn up, you should have an audience eager to get involved. Even so, your collaborations have to work hard and show that the time is well spent. In your workshops some people will feel they can’t be seen not tapping away at a keyboard. Others will have to duck-out half way through to take a call and there will always be at least one who is there because they’ve been told to but have no idea why. In the opening segment of this three-part series I looked at ways to get buy-in from sceptical stakeholders. The next and final instalment will suggest what to do with the ‘map’ once it’s been created. 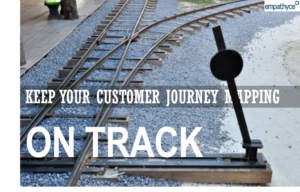 This second piece therefore is about keeping your journey mapping workshop on track. It’s easy to get derailed so asking the right questions, documenting the answers and making it an enjoyable experience for those taking part are central tenets of any journey mapping session. Here though, are five more suggestions for making sure your time with others is going to generate compelling insights and position you as the go-to person for customer experience. Firstly, we need to be really clear about exactly who is doing what and why. To improve an existing experience or design a new one we must have genuine empathy with those on the receiving end of what we do. Traditional segmentation approaches that give us Millennials, socio-economic groups or B2B vs B2C are helpful but only to a degree. Generational Marketing for example, assumes that everyone born around the same time will follow similar behaviours. For an organisation wedded to metrics, processes and projects, commoditising customers in that way may feel more comfortable. Yet it fails to highlight that we’re dealing with real people who interact with us because of real needs and wants. They have different motivations, hopes and expectations. And there are real, personal consequences if we get it right or not. By bringing customers to life as a person not a segment, we can show the rest of the business what’s most important to them and why in a more meaningful and engaging way. Give the persona a name, draw a picture of them or a day in their life. Take time to discuss what they think, say and do. We’re talking here about customers but the mapping exercise can – and should – be done equally for employees delivering the experience, stakeholders and partners to empathise with them too. Chances are you’ll identify a number of personas, all of whom have the potential to go on many different journeys with you. We can’t do justice to journey mapping by trying to do everything at the same time so we need a focus and a clear scope. Multiply the number of personas by the products or services they’re buying, the number of reasons they are interacting and then by the channel permutations and the number of possible journeys can quickly be measured in the hundreds if not thousands. Which one to map? Some will jump out more than others especially where there are burning platforms. Others will emerge as you go along; a touchpoint can be drilled into in more detail to become a mapable journey in its own right. But as far as possible, choose one persona doing one thing and stick to it; have a crystal-clear scope for this journey and plan to deal with the others later. The journey maps will then highlight the things are most important to your customers. They will show how well you do those things – if indeed they are measured – so you know how well (or not) you do the most important stuff or where you’re wasting effort. You’ll end up with a long list of ideas but they can be organised so you focus on protecting the important things that are done well, pounce on the significant experiences that are done badly and stop doing the costly work that customers don’t value. It’s one of the most essential elements of journey mapping yet it’s also the easiest to fall foul of. Short of asking customers directly (more of that in a moment) the only way to truly see things from their perspective is to act and think like them. The personas you’ve created will guide you. Take on the persona and pretend, role-play their interactions. If you’re facilitating the session watch out for comments like “Yeah, but the reason why we have to do it like that is because ….” and “The customer doesn’t appreciate that what we have to do is…”. We are not creating a process map. When the team is in full flight it’s very easy to revert to the day-job. Just for the avoidance of any doubt, I repeat. We are not creating a process map. Quite the opposite: we need to know what it is like to be on the receiving end of our processes. An effective discipline here is to use “I… “ statements. In other words, use their language not yours. When the sticky notes are flying onto the brown paper, use phrases like “I’m choosing” or “I’m paying” rather than “Browse website” and “Purchase” respectively. A valuable by-product of journey mapping is that cross-functional teams get to know their own business better. By all means share the ins- and outs of what you do, it’s a great – and from what I see an all-too-often unique – opportunity to do so. But while those conversations nurture internal understanding, they are not always ones you’d feel happy having in front of customers. For them to hear that their premium-priced service is actually quite fragile and held together with string and tape isn’t great. Or, that one part of the business really doesn’t know what the next bit does. It’s the main reason I advocate that customers only get the opportunity – and they must at some point – to validate and iterate the journey once you’ve agreed the starting point internally. On the flip-side, where you are mapping “What could the future look like?” scenarios, having customers’ input and creativity coupled with successful design-thinking and ethnography is as essential as it is priceless. Unless you magically happen to burst into someone’s life the instant they think they might need you and then disappear forever just as quickly when you’ve got their money, the traditional end-to-end thinking can be flawed. From a customer’s perspective, it won’t start with the initial enquiry. More likely, it will begin with an event in the customer’s life that triggers the need or desire for the first or next interaction. It’s best to start where there is no current or active relationship with the brand as it will then become clear how what you do fits in with their life, not the other way around. The final end point may equally be a shade of grey but one thing every journey should have is touchpoint under the heading of “I’m sharing my experience”. It may be during or at the end of the experience but if nothing else, it forces the team to think about where a customer might tell the story of their experience, however unstructured, usually once it’s over. If that’s not plugged into the current feedback system and usual reactive surveys, there’s one action to add to the list already. I wrote about that specific issue in a separate blog here. So journey mapping is an incredibly insightful tool but it must be done effectively and with discipline if it’s to yield the results that will drive a business forward. The final instalment in this three-part series about customer journey mapping will look at what should happen next. In the meantime, if you’ve your own suggestions on how to ensure journey mapping is working hard for you I’d love you to share them. Thank you. I’m Jerry Angrave, a Certified Customer Experience Professional (CCXP). I’m a CX consultant with an extensive corporate background and also specialise in professional development for those in customer experience roles. Feel free to contact me with any questions – by email to [email protected] or by phone on +44 (0)7917 718072. More details at the website www.empathyce.com. Customer Journey Mapping? Why not? Customer Journey Mapping, done. What next?